Kwasna H. & Bateman G. (2007) A new species of Galactomyces and first reports of four fungi on wheat roots in the United Kingdom. A new species, Galactomyces britannicum (IMI395371, MycoBank 511261), is described from the roots of wheat in the UK . Dendryphion penicillatum var. sclerotiale, Fusariella indica, Pseudogymnoascus appendiculatus and Volucrispora graminea are reported for the first time from roots, rhizosphere or stem bases of wheat in the UK . A microconidiogenus synanamorph is described for V. graminea and the species is epitypified to reflect this amendment. Keywords: Dendryphion penicillatum var. 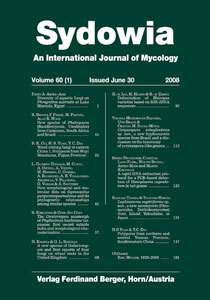 sclerotiale, Fusariella indica, Galactomyces britannicum Pseudogymnoascus appendiculatus, taxonomy, Volucrispora graminea.